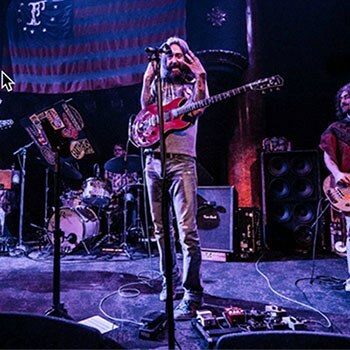 The former Black Crowes vocalist has achieved a rare feat with the Chris Robinson Brotherhood, striking sonic gold with a second band after the dissolution of the one that made him a rock star. It was a Wednesday night in the City of Angels and the local freak power congregation was out in force to hear Chris Robinson and company testify. The former Black Crowes vocalist has achieved a rare feat with the Chris Robinson Brotherhood, striking sonic gold with a second band after the dissolution of the one that made him a rock star. But that’s what “farm to table rock ‘n roll” is all about as the band calls it, a down to earth organic formula of devotion to the rock gods and muses. The dedication is obvious from the band’s heavy touring and deep psychedelic jams, resulting in a sound that draws the true believers like moths to a flame. Robinson has put together a top shelf quintet with guitarist Neal Casal, bassist Mark “Muddy” Dutton, drummer Tony Leone and keyboardist Adam MacDougall. The band’s chemistry just keeps growing, with each tour over the past four years finding the band jamming on a deeper level that indicates a group on an intriguing path of ascension. There’s also an honest old school connection with the fan base that stands out in an era where too many bands only play 90 minute sets and tour sporadically. CRB fans know the band is going to come around at least once a year, if not several times with their three-hour shows. They’re also probably going to bring their own beer. Many fans were initially dismayed upon seeing the El Rey’s weak beer selection, for which there’s no excuse in this era of the craft beer boom. Would they really have to drink Shock Top or Stella Artois? Thankfully no, as a second glance revealed cans of Brotherhood Steam, the CRB’s dry-hopped collaboration with the legendary Anchor Steam Brewery in San Francisco. Now that’s a band that really loves its fans, saving them from having to drink watered down corporate swill. It took the band a few songs to really get going, as can happen on a long tour sometimes (and this was the last week of the fall tour.) The sound started to gel midway through the first set during “Star and Stone” though, a cathartic type of bluesy Americana song that highlights the partnership between Robinson and Casal. It might not seem like a prime jam vehicle at first, but Robinson’s soulful vocals seem to inspire a musical voyage. Casal’s nimble melodic licks carried the melody higher in conjunction with MacDougall’s harmonic accents, with Dutton and Leone deepening the groove in turn until the band was suddenly firing on all cylinders. This led to further sonic explorations in “Meanwhile the Gods” and “Tulsa Yesterday,” with the band moving into what felt like a mystical psychedelic pirate jam on high seas. This psychedelia kept evolving until it found its way into another jam reminiscent of the Grateful Dead’s “The Other One.” The Dead are a generous ingredient in the CRB’s farm to table sonic stew and such jams are always crowd pleasers. The band ended the set with a bang by rocking out on Delaney and Bonnie’s “Poor Elijah,” a bluesy rave-up that also dips into the Black Crowes’ repertoire. Robinson played guitar here, enabling Casal to deliver some great slide work. The band built a big feel good groove that had the assembled getting down, with Casal and MacDougall both taking extended solos that kept the jam flowing. It was the kind of groovy jam that carries the congregation to the mountaintop and hence there was a vibe of elation during the half hour set break. “Boppin’ the Blues” picked up where “Poor Elijah” left off, with the band engaging the audience for a festive set to make this one of the best shows Los Angeles has seen all year. “Little Lizzy Mae” conjured a bit of a Dylan-ish “Subterranean Homesick Blues” vibe, another large influence on the CRB. This influence appeared again with a smoking cover of Dylan’s “She Belongs to Me,” except with the classic tune re-arranged like a Jerry Garcia Band dance party jam ala Garcia’s version of “Tangled Up in Blue.” The congregation was cutting loose again and the good times were rolling. The theme soon continued with a cover of Dylan’s “Tough Mama,” in the upbeat style again favored by the Jerry Garcia Band. The disco style funk of “I Ain’t Hiding” provided the only Black Crowes song of the evening, keeping the energy level high. The tune can make one wonder why however Robinson doesn’t have any of the other songs from the Crowes’ outstanding last album Before the Frost/Until the Freeze in the CRB repertoire, since there are so many now unsung gems on it. But the CRB repertoire has been growing nicely with three albums in four years (and another on the way in 2016 reports say.) The band capped the show in style with a bustout encore of “Lonesome LA Cowboy,” a New Riders on the Purple Sage classic written by Peter Rowan. The tune about smoking dope and trying to write a song fit the CRB like a glove, closing the evening’s rock ‘n’ roll sermon with an appropriate local flavor for all the LA cowboys trying to get to themselves to the next level. With only a handful of rock heroes from the first wave of the socio-cultural musical revolution in the 1960s still going in 2015, devotees to the spiritual power of rock ‘n’ roll are able to rest easy with a number of second generation rock disciples to carry the torch. The Chris Robinson Brotherhood is certainly a leading trailblazer on the modern path of rock ‘n’ roll salvation.